It is day #2 of Simon Says Stamp Blossoms and Butterflies release blog hop. Hope you had a wonderful hop yesterday with plenty of inspirations from designers. Today is another day with more designers sharing their inspirations. Hope you enjoy day #2 as well. Hello and welcome! You should have come from the talented Anna-Karin Evaldsson’s blog. If so you are on the right track. If not don’t worry you are the last stop on the hop. I will list all the designers in today’s hop towards the end of the post. I am so excited to share couple of cards with you today. I also have a video tutorial for one of the cards. My favourite stamp set from this release is the Wake Up & Make Up stamp set and comes with coordinating dies as well. I have a teenage daughter. She is into makeup which got me interested in it. After watching a few hundred makeup videos on Youtube, I now have a collection which I share with my daughter and I can do basic makeup like contour, baking, bronzing, eyeshadows etc. I did my daughter’s makeup for her year 12 school ball and it turned out well. Now I have a few friend’s daughters lined up for their school ball and dinner dance make up with me. 🙂 You can now imagine, how happy I was when I saw this stamp set and dies. I literally did a happy dance, took a photo and text it to my daughter who was at school. Lol! Stories aside, here is the first card. Here is the video tutorial of the card. You can also watch this video on my Youtube channel. The shimmer on the liptsticks are just so beautiful. Oh I wish I can add shimmer to everything Lol! Here are some closeups of the card for you. Remember that panel from the video where I stamped the sentiment slightly towards the right and not in the top centre? I used that panel to make this second card. I stamped all the makeup images and coloured them using copic markers in cool gray, red and yellow colours. Then using the coordinating dies, I die cut them all out. I adhered them all around the sentiment covering the entire panel. I added shimmer (of course) to the images, glossy accents to the lipsticks and blush. I also outlined the die cuts using C1 grey maker to add shadow. The panel is adhered to Fog card base using foam adhesives. Simon is giving away a $25 gift card at every stop on the hop! For a chance to win, leave a comment here and all along the hop. Winners will be chosen over the weekend and posted on the Simon Says Stamp blog, Wednesday, March 13th. 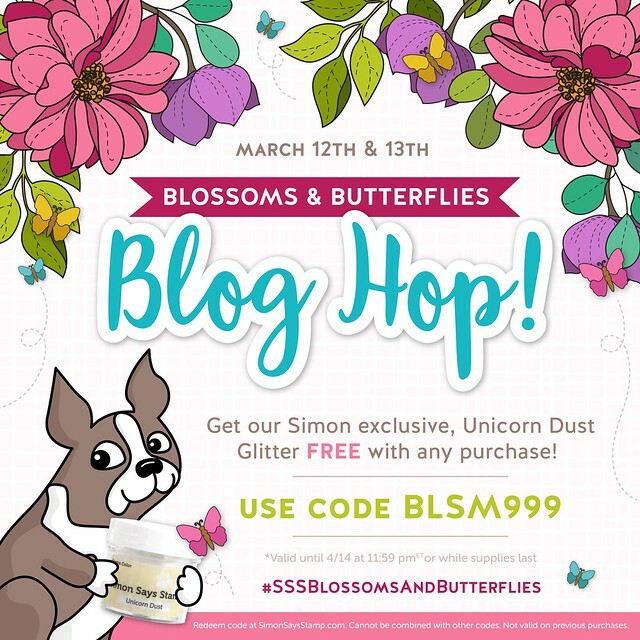 Don’t forget to use CODE: BLSM999 to get free Unicorn Glitter Dust. Here is all the release products for you. Simon Says Stamp Blossoms and Butterflies release. You next stop is back to Simon Says Stamp Blog. Make sure you leave comment here and on all the stops in the hop to enter a chance to win. Have a lovely weekend. Happy Hopping! I do like all the bright colors and the wow it gives your cards. Thanks for your copic coloring too! Your makeup cards are so fun! I love them both!! I also the shimmer! Oh my goodness. I love the make up card! This release is killing me. First SSS release where I have wanted it ALL! Two super fun cards! I love the bright colors you used on them — it makes the stamped images “pop” off the card at you! A lovely duo of cards! The first sentiment especially made me smile! Fantastic cards! I love them both!!! These are really cute uses of this Wake Up and Make Up stamp set. What a fun way to end this inspiring blog hop! It’s always great to see all the different approaches to using these products! made with all of the beauty implements. Super cute cards with great colors! Your cards are so colorful and clever! Your cards are so gorgeous and colourful, Gayatri! I fell like I could pick up every lipstick and item off the card! Thanks so much for sharing your wonderful inspiration! Both cards are just beautiful. Love the shimmer on the lipsticks too. Thanks for sharing and posting. Such bright and colorful cards. Love them. I love this stamp set and your cards have inspired me to go ahead and order it. Beautiful cards! Gorgeous cards Gayatri, I love them both. I think this is such a great stamp set to make cards for teenagers. That’s sometimes hard to do. Thank you so much for showing how to make the first card, have a great Sunday. Wow, what fun and colourful cards with this stamp set! Love your off-center sentiment on the first card. What fun cards. I just love the rainbow lipsticks. Such bright and happy cards!! Love them both! Wow your cards are awesome. Fabulous job. Love this makeup set. My daughter is fabulous at this art. Thank you for sharing and the inspiration. I can’t wait to get my hands on this set. delightful cards and love all the colors!! Love your coloring! Great cards! Very cute and colorful cards and a cute message. Such fun cards! Loving this release! How fun that you can share your makeup tips with your daughter – and now in stamps, too! Love your fun & bright cards. Very beautiful cards, Gayatri. Love the bright colours. I am loving all the woman focus on your cards! The lipstick card is the best. The blue ok nes remind me of the Japanese TV commercial that Joey from Friends did in one episode-when Chandler lies and says he watched the demo tape but never did! Love the uniqueness and c ok congrats on your side business of makeup application! Great work! Such fun and bright colors!! Great cards! Love both your colorful creations!! I have already bought that makeup stamp set…it is awesome! Nice job, love the colors, the uniqueness, the coloring, thanks for sharing your inspiration! These are so pretty, who doesn’t love a rainbow of lipsticks? Awesome coloring on both cards. The shimmer on the lipstick is the perfect touch! Love your fun, colorful cards. The colors are beautiful and your coloring is amazing. I love this make up set! Such great sentiments! Great coloring on the lipsticks! Great coloring on your cards! I love the lipstick and makeup cards. So many girlfriends would love to receive. Your cards are cute and fun. Such a great release. Gorgeous cards! I love the bright images & those wonderful sentiments! You’ve done such a beautiful job of shading on your cards. They are all wonderful. I love the rainbow of lipstick tubes! Both of today’s cards are very special. I love your color choices. And a big thank you for the video. This has been such a fun blog hop. Great new products…and a lot of talented designer/illustrators and artists share so much….thank you so much…have an awesome weekend. Hugs! Rainbow lipstick — love it! They are all so cute. Love your coloring. Love your cards! The make up set it so fun!! WOW lovely cards, thank you for the idea of using the shimmer. I never knew they had something like that. This was my very first blog hop and I got some fantastic ideas from all you wonderful ladies. Thank you all so very much. 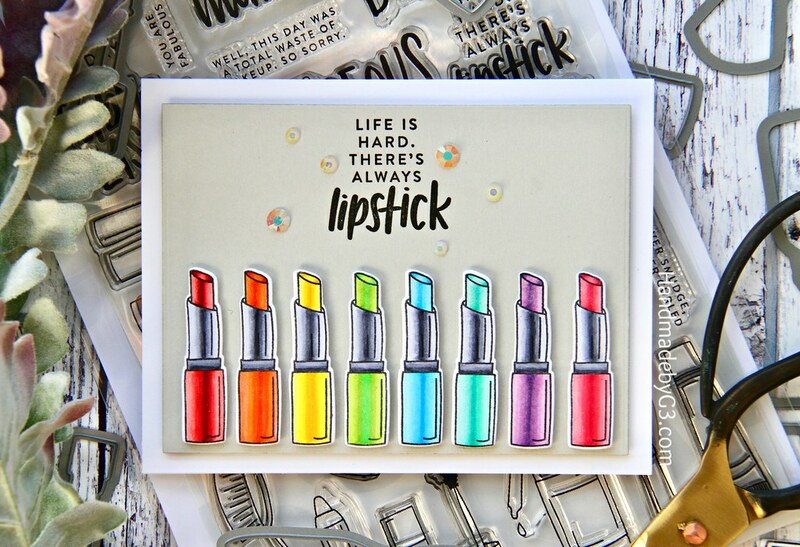 I love the rainbow lipstick card. 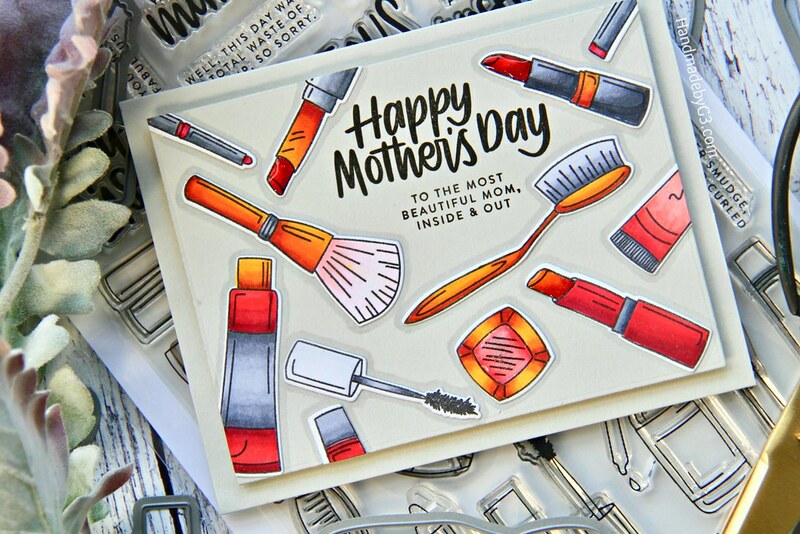 So much fun, The card with the makeup images makes a great Mother’s Day card. Your cards are so happy and fun. I love these cards…I have several friends that this stamp set would make wonderful cards for. The makeup stamp set is just too cute!!! Love your cards! Thank you for sharing!!! these cards are so much fun! they make me smile. That stamp set is such fun. Love your cards, colourful and shimmery. Ha, you made me giggle. What fun cards. Lovely strong colors. How come everything’s dated in March? Wonderful cards, Gayatri. Love this release, there is something for everyone. 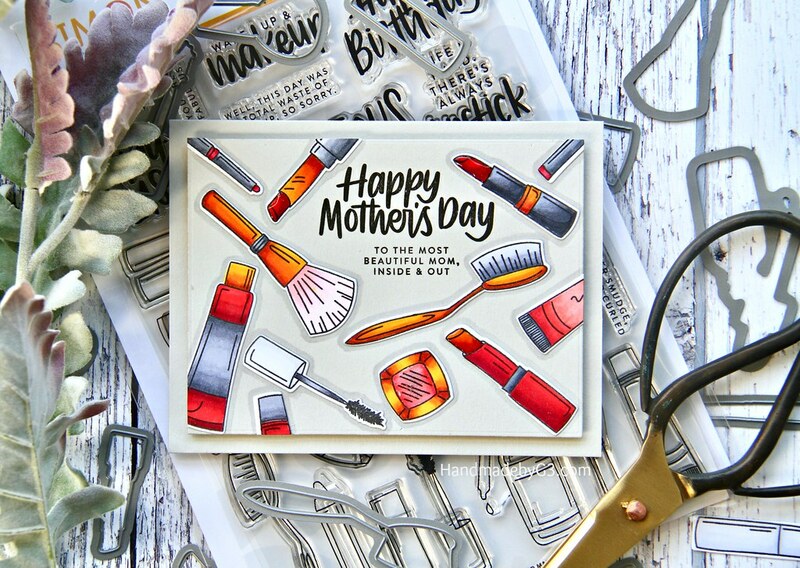 Love this stamp set and you have created two beautiful cards! Makes me ant to try a bunch of lipsticks! Fun, colorful cards! Thanks for your creativity!!! Love the details of your cards! Lovely job. Great use of the SSS products. Thanks for sharing your creativity! Such pretty, colorful cards. Thanks for the video. Really Fantastic cards!!! Super Fun!!! Hello, I really enjoyed your video. You’re right, it didn’t matter about the colour order – the card is great and so is the second one. Very cute, both of them. I’m loving this new release from SSS – so much to play with and so hard to choose what I can afford. Thanks so much for sharing your cards with us. Your cards are so cute and colorful. Cute cards! These makeup designs will be perfect for teens. Hi. As stated on some of the other comments, the product used to color in the lipsticks on your first card are so vibrabt. A simple design but yet so neat and clean. Beautiful cards and so colorful. Your coloring was done so well, great job! Stunning cards. Love how bright and happy they are. Your coloring is gorgeous.TFS. Awesome release, awesome cards! I really love the multi-colored lip sticks! Really brilliant cards! Love the bright colors and creativity. I especially like how you colored the brushes. But the lipsticks are so cute. They reminds me of a MAC ad. Beautiful Cards. Shimmery is the best. Love this fun make up set! Awesome cards! That make up set you used is my favourite from this release. Maybe because I love a vibrant lipstick like you created on your cards. Love the bright and vibrant colors you used. This stamp set is just so amazing. I am in love with it. Oh, how fabulous cards for Mum day!! Love the stamps, so useful for any woman’s project! Amazing design and colours, love especially the first one! such fun cards!! I LOVE the lipsticks!!!! probably my fav!! thanks so much for sharing!!! Great cards. Your coloring looks fantastic. I like the sentiments. Fun cards. Thanks for sharing! brilliant cards! those stamps are so fun! Absolutely love both the cards; especially the first card with pop of colors stole my heart. Thanks for the great inspiration! these cards are super nice! Love the make up set, and you have used it so well. great inspiration. thank you. The rainbow row of lipstick is so cute! What a great idea! Have fun playing in make-up with your daughter! Fantastic Copic coloring on these images!!!!!! They are all beautiful and fun cards! 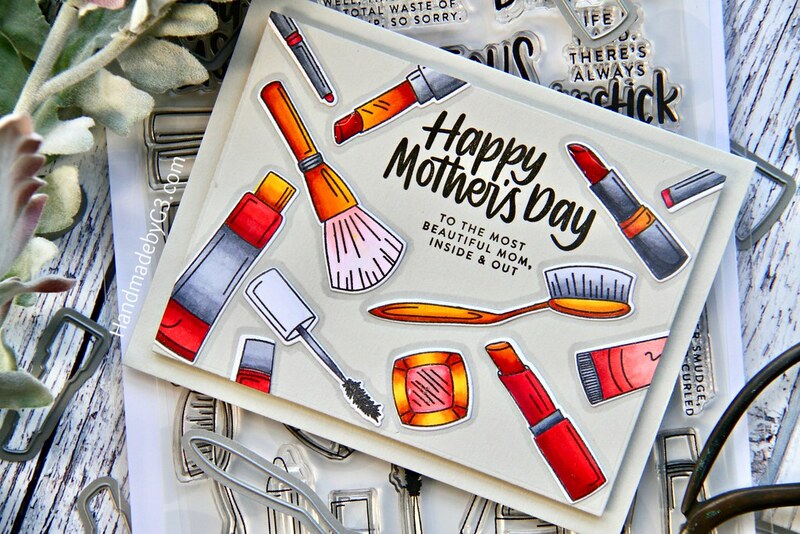 Great cards, I especially love the first one – the colouring of the lipsticks is fabulous! Love the colours that give brightness & pop to your wonderful cards. Such a cool idea to make the colour of the lipstick tube match the lipstick colour too. Any mom would smile receiving this. Thanks. Such fantastic cards! Love the makeup theme. Beautiful cards! I love the bright colors and great designs! I love your love for shimmery things! Such fun cards and beautiful coloring. I LOVE the colors you chose for these cards they truly stand out and are perfect and Simon Says offering Unicorn Dust Glitter Free and a $25 chance for shopping – Whoo Hoo….. I love the different colors you used on the lipsticks. So colorful and cheerful. Very fun too!! I love your Mother’s Day card too. It’s fabulous!! I wonder, did you send the lipstick card to your daughter?? Super cute makeup cards. I love the lipsticks. Thanks for sharing your makeup themed cards with us, they are so fun! My daughter is my “makeup and skin care guru”, I’m so blessed to have someone to do that as your daughter has you! Great cards! Love the shimmer! My granddaughter’s room is painted with a paint that has glitter in it, so it can be done! :o) I like the use of the fog cardstock panel. Something new to try! Thanks for the inspiration! So beautiful & fun! Wow! such fun designs with the equally fun stamp set!! very cute cards! great stamp set! These would make a great gift to a girlfriend. Thanks for sharing with us! Such fun cards! I love the rainbow lipsticks! Fabulous cards! Love your playful style. This set is so much fun! 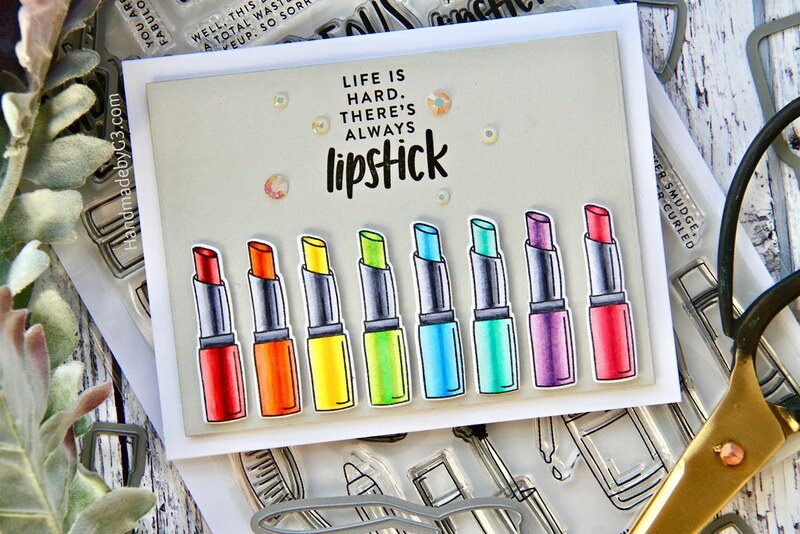 Love both your cards, especially the rainbow of lipsticks! Oh wow! Gorgeous cards!!! Your colouring is really amazing!!! Such fun cards! What a cute stamp set! 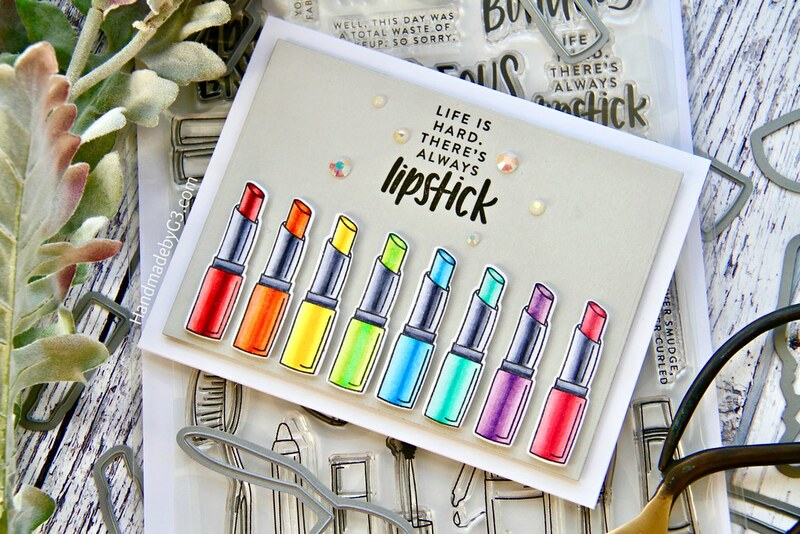 Love the rainbow lipstick card! Cute, fun and colourful creations! Wow, the illusion of shine that you achieved on your lipstick tubes is incredible! I can’t wait to watch your video. Thanks for sharing; even though I’m not into makeup, my nieces are, so I’m really excited about this stamp set. Loving the rainbow lipsticks! Awesome card! Your cards are so bright, cheery, and so fun, Gayatri! Your Copic coloring is awesome! Thanks for sharing your creativity with us! Amazing! Thanks for the video. I also liked that fact that even the pro’s sometimes have to try different colour combo’s to see which ones they like the best. I find that’s what always takes me the longest when making a card! The stamps you chose are SO MUCH FUN and make perfect cards for the ladies in your life! Thanks for sharing your beautiful card designs! Make up cards are so fun! I love the colors you chose! Great cards, love the choice of colors. This set is so fun with all the different makeup images. I love your rainbow card!